We got up a little lazily as my meetings didn’t start until 08:30, and M. was planning to have a shower last thing before leaving for the airport at 13:30. I had a bowl of brain flakes and today tried another bagel, this time toasted. While I went to my meeting in the morning, M. went to the Met to check out the artwork there. The meeting ended early, a bit before 12:30, and I went back to the hotel to find M. there packing her bag and getting ready to leave. The shuttle bus was picking her up at 13:30, and I waited with her until it arrived, then set out to walk north to the Met for our afternoon tour of the museum, arranged by Scott G, who works there. 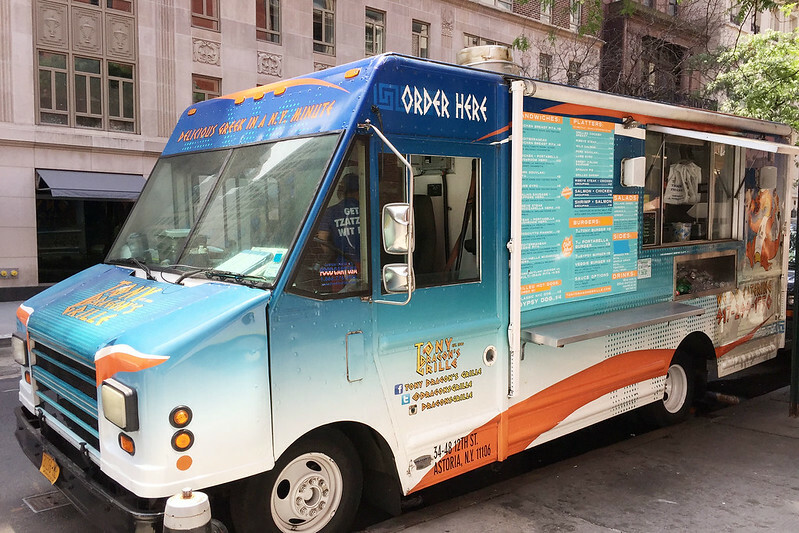 On the way, I stopped at a Greek food truck called Tony Dragon’s Grille on the corner of Madison Avenue and bought a lamb gyro, wrapped in a thick pita bread. It was a little messy to eat on the street, but delicious, with hot lamb slices, salad, and tzatziki. Madison Avenue got fancier as I went north, with expensive fashion labels and jewellers lining the street. 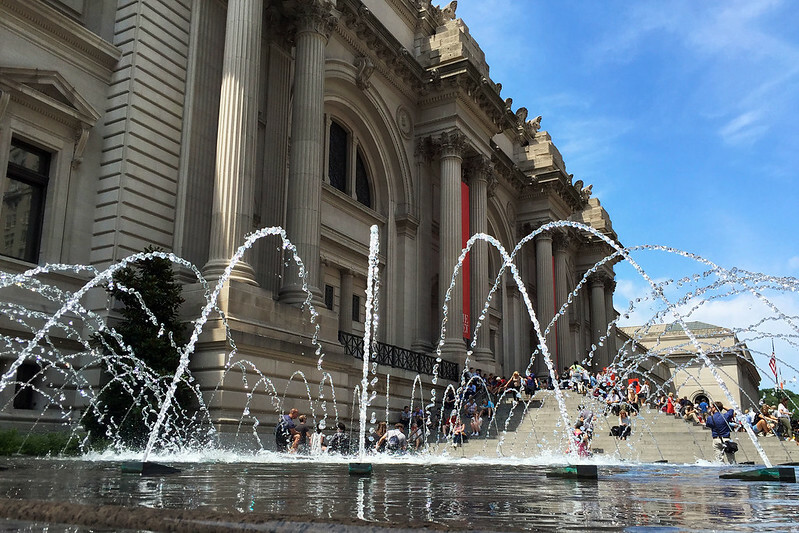 At 81st Street I crossed over to Fifth Avenue and the Metropolitan Museum of Art. Several of the ISO people were waiting there at the top of the steps for Scott to arrive and show us in. He arranged tickets for all of us and then led us up in a huge lift to the 4th floor and the photographic department. This occupied a space directly above the massive entrance hall of the museum, and we could see the upper sides of the great domes which can be seen far overhead when standing on the ground floor below. Here we were introduced to the photography staff, about ten people plus a couple who were away this day. Scott gave a short presentation on the work the department does, photographing and recording exhibit items in the museum. Then another guy gave a talk about the new 3D scanning work the museum has been doing, which is all fairly recent, as they only really started in earnest this year. After this we got a tour of the photo studios where they shoot images of various items. In a couple of them staff were lighting and shooting photos of bronze statuettes. Each item requires careful hand crafted lighting which is done with large white diffusers arranged in various configurations, and takes anywhere from a few hours to a day to shoot. In another studio a woman was setting up a rig to shoot illuminated manuscripts, which require very careful lighting to capture the reflective quality of the gold leaf properly. During the tour Scott mention that the museum employed 2500 people, and that museums are responsible for around 4.3% of the US GDP. After the tour, Scott suggest we all go to the roof bar for a drink. This involved a long and convoluted path back down to the ground floor then up another lift and finally up a flight of stairs. The roof was exposed to the sun and full of people, so rather than hang out I said my goodbyes to everyone until our next meeting in London, and went back down into the museum to explore the exhibits. Being a Friday, the museum was open until 9pm, and I had about four hours to explore. But this was not nearly enough, as I whizzed through the exhibits, picking and choosing the sections I wanted to see, and not even really spending enough time in those. 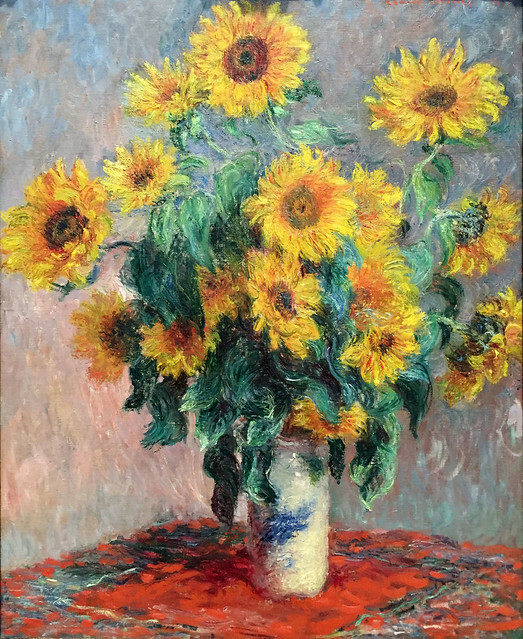 The first stop was the 19th century European paintings and sculpture, which was 31 rooms full of impressionists and those around that period, including Monet, van Gogh, Seurat, Sisley, Bonnard, Gaugin, Manet, Renoir, Degas, and so on. There were a dozen or more Monets and a similar number of van Goghs, which were amazing, and one of Renoir’s two girls at the piano, another version of the same painting we’d seen in Paris. There were maybe 50 or more Degas studies and completed works of ballet dancers, both in pastels and bronze sculpture. 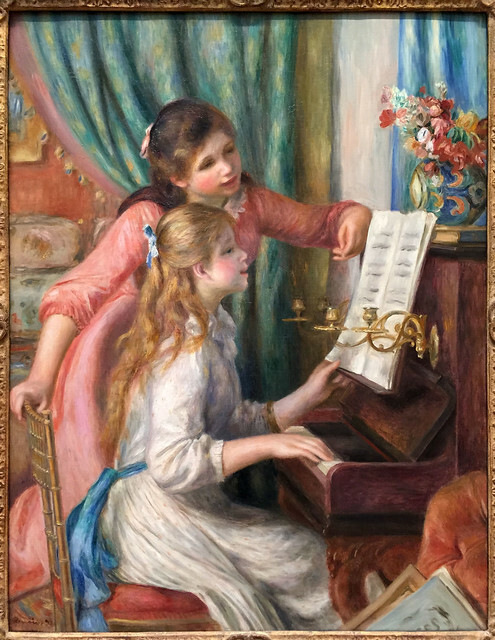 Young Girls at the Piano, Pierre-Auguste Renoir. After this amazing collection, I bumped into Scott, who was showing Paul around, and he asked if I’d seen the Pergamon special exhibit yet. I said no, and he said I had to, so I headed there next. This was a temporary exhibit showing many items collected from the excavations of Pergamon and borrowed from other museums, and was indeed well worth seeing. 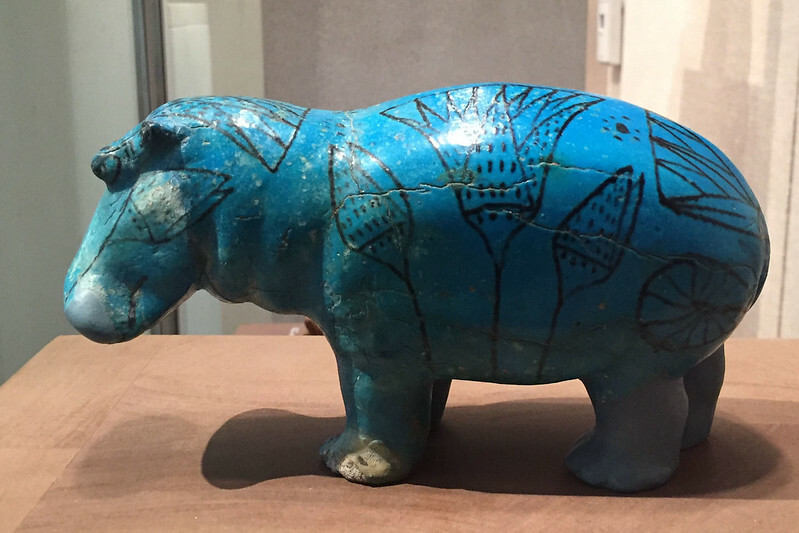 Nearby was another special exhibit on an early Islamic culture, so I checked that out too. Next I moved on to 13th to 18th century European painting and sculpture, hoping to find some works by Botticelli, and possible things by Leonardo, Tintoretto, and so on. I found mostly a whole lot of Dutch painters, and some tantalising rooms that had been closed off and so couldn’t explore fully. There were some cool things, including a stunning Madonna and child by Filippino Lippi, which used the most amazing ultramarine blue, but unfortunately I didn’t spot any Botticelli at all. I wanted to head downstairs to the Egyptian art next, and took a route passing through the American sculpture court, which had some very cool things in it, including a moving marble sculpture of a blind girl walking the streets of Pompeii during the volcanic eruption. 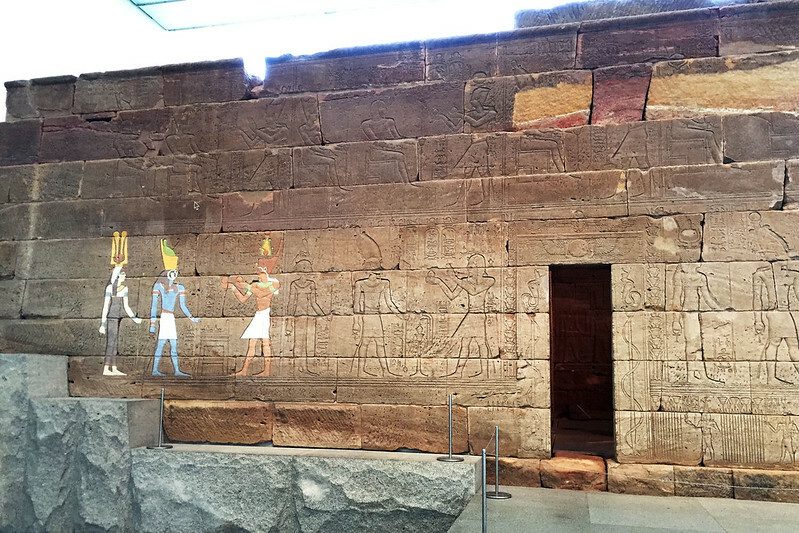 From here I went to the Temple of Dendur, which is a huge room devoted to hosting the remains of an entire Ancient Egyptian temple. This was pretty cool, and they had a pool planted with papyrus partly surrounding it. Next I crossed the great entrance hall of the museum to the ancient Greek and Roman art. There were dozens of sculptures, mostly Roman copies of Greek works, as well as wall frescoes and floor mosaics, and other bits and pieces. Here were also two of the original Roman bronze crabs from under the corners of the obelisk we’d seen outside the other day, which had actually been replaced by new copies when it had been erected in Central Park. Upstairs from here was the ancient Near Eastern art, from Mesopotamia and Assyria. This was very cool, as it included two massive shedu guardian sculptures, flanking an entrance to a room lined with bas relief sculptures from the inside of an Assyrian temple. 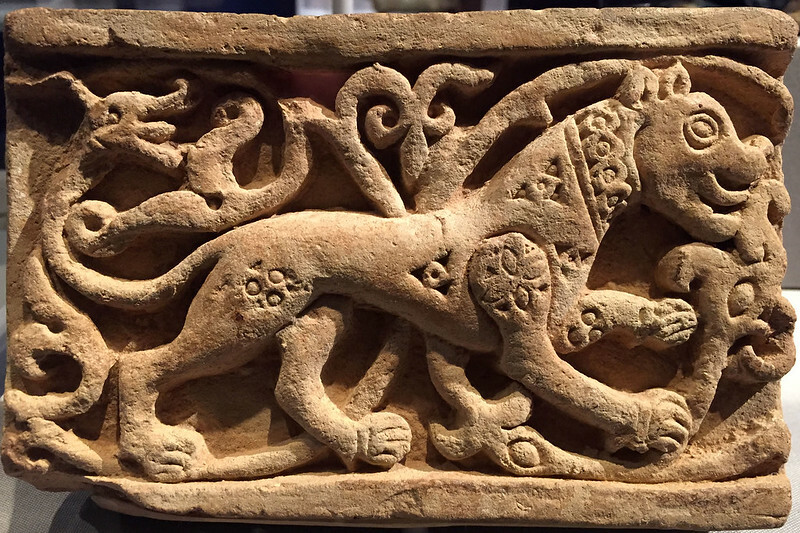 These showed a king and attendants, and various mythological beings with animal heads. By now it was getting late, and I hurried back downstairs to the medieval European art section, though this tends to be mostly religious iconography which doesn’t appeal to me as much as later art or ancient stuff. But heading through here led to rooms of European sculpture and decorative arts, which held some interesting things, including furniture, table settings, vessels, chests, and so on. 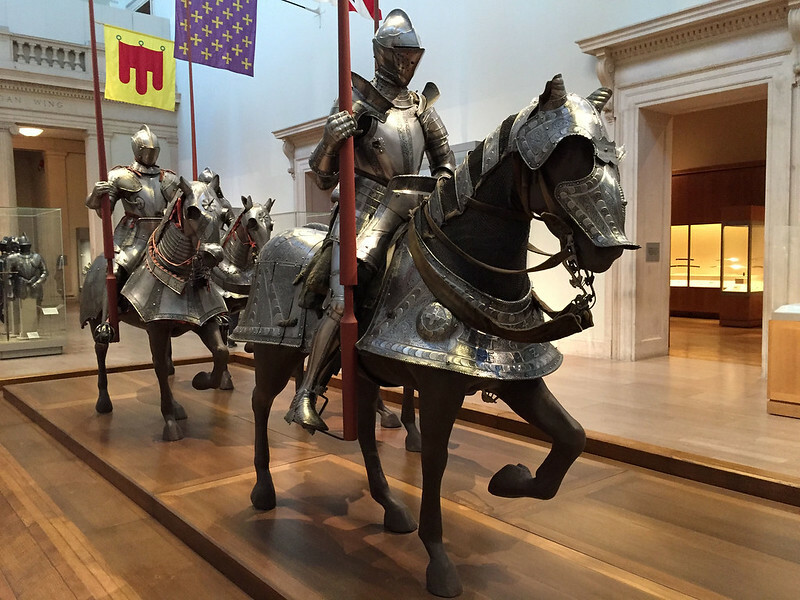 And out the side of this section was the arms and armour, containing a large room with several suits of medieval armour, including four mounted on horses. The surrounding rooms contained swords, more armour, other medieval weapons such as crossbows, and then as I worked my way around, antique firearms, Islamic arms and armour, and East Asian varieties. Back in the decorative arts, there were more furnishings ranging from Renaissance to Enlightenment and thereabouts, including several fully furnished rooms: bedrooms, hotel guest, rooms, drawing rooms, and so on. There really were a lot of these, and they were very sparsely populated with visitors, as opposed to the crowds in the European painting and sculpture areas. I. several rooms I was the only one there, only occasionally spotting a museum guard now and then. Even given all the stuff I saw, I missed entire huge chunks: all of the Asian art, African, Oceanian, and art of the Middle East and Central and South Central Asia, as well as all the native art of the Americas, and European American art, plus all the modern and contemporary art. It really is a huge museum! For the last 20 or so minutes before closing time I planned to check out the museum shop. However when I got there, it had closed; clearly they must close it at least half an hour before the museum closes. I left into the warm Manhattan evening, walking over to Madison Avenue to walk south back to the hotel, and hopefully find somewhere to have a late dinner on the way. This was however mostly closed and uninteresting at this time, so I crossed back to Fifth and walked down the side of the park until I reached the bottom end, then crossed all the way west to Columbus Circle, intending to take Broadway from there. But from here Eighth Avenue looked more interesting, so I walked down there as far as 50th Street, then turned to find the Irish pub where we’d had dinner the first night of the trip, Emmett O’Lunney’s. 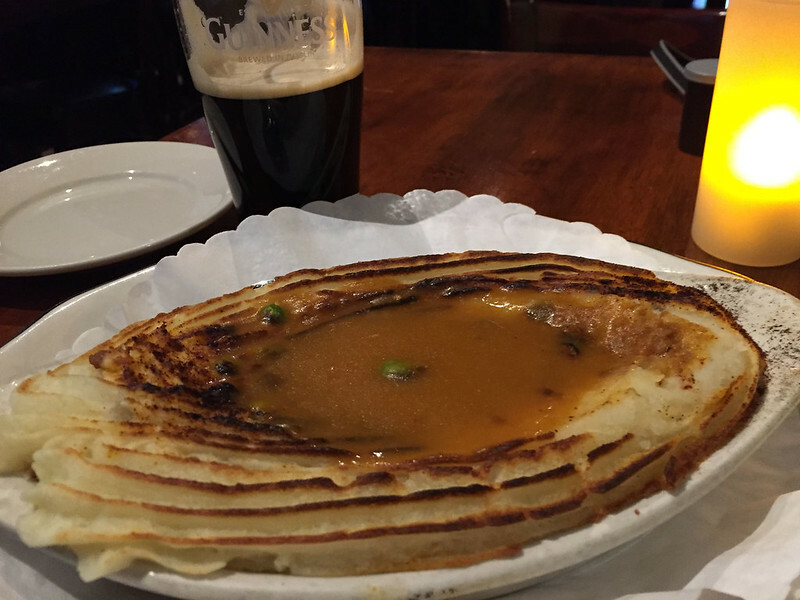 I felt like something homey and comforting, so had the shepherd’s pie and a Guinness. The pie was a mix of beef and lamb mince in a gravy topped with mashed potatoes and baked, then the potato was topped with more gravy and a smattering of peas. It was pretty decent. And then because M. had wanted me to try a New York cheesecake while here, I had a slice of that for dessert. It was nothing special, being much like cheesecake anywhere else, but had the odd distinction of having the biscuit crumble on top rather than as a base. I have no idea if that’s normal or not for a “New York” cheesecake. Following that, I went back to the hotel and prepared a few things for packing in the morning, before going to bed. This entry was posted on Thursday, 18 August, 2016 at 21:11	and is filed under Diary. You can follow any responses to this entry through the RSS 2.0 feed. You can skip to the end and leave a response. Pinging is currently not allowed.